This is a extremely rare flag is one such example of the type. Its fifteen stars represent the fifteen slave states and its eleven stripes represent the eleven seceded states of the Confederacy. The canton of the flag sits on the red "war stripe" or "blood stripe". 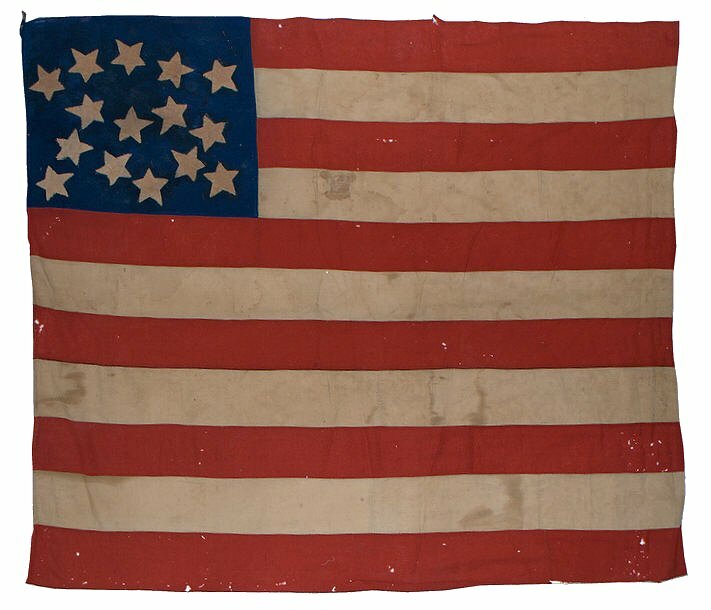 Among early American flags in the Stars and Stripes format, those made as Confederate prototypes are highly sought after, since they embody the conflicting feelings those in the South felt about keeping a semblance of the flag of their forefathers even in the face of separating from the Union. Even the first officially adopted flag, in the Stars and Bars design, kept a wreath of stars on a blue canton of and three broad red and white stripes--much the same configuration as the Stars and Stripes. The pattern of the stars on this flag, with an arc of 5 stars above a jumble of the remaining 10 stars, is visually interesting, and may also be symbolic. Four of the slave states--Missouri, Maryland, Kentucky, and Delaware--were known as "Border States". Ultimately, they did not secede from the Union, but in early 1861, their fate was still uncertain, with spirited debate in each of their legislatures both for and against secession. Five states--these four border states, plus Virginia, formed the demarcation line between the North and the South, and it's it's likely that the arc of five stars at the top of the canton represent these states. The flag is entirely hand sewn, and the fifteen crude stars are double-applique and hand stitched to the beautiful blue canton. The canton is diminutive and occupies a small quadrant of the flag--a characteristic of some of the earliest American flags, which often give deference, as this flag does, to the broad stripes over the bright stars. The wool of the flag is a very fine weave, possibly a blend, and it's apparent that the flag is made of older homemade materials found at hand which pre-date the making of the flag itself. It's a wonderful representation of the old South, made during the tumultuous outbreak of the Civil War in the early months of 1861. Learn more about rare star counts.